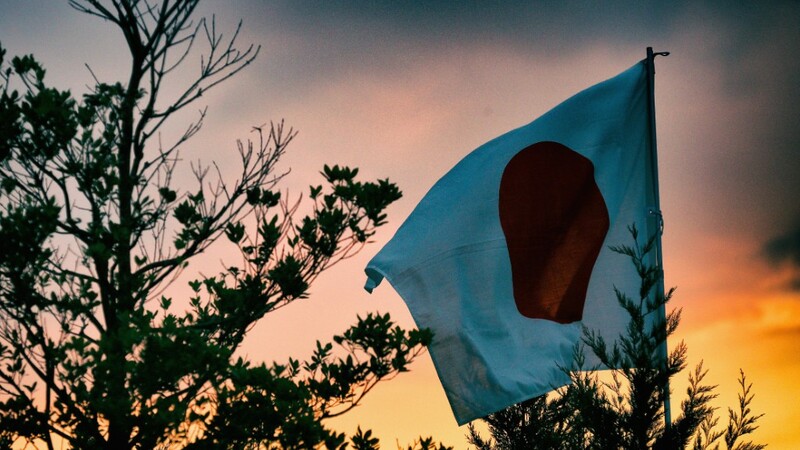 Trick or treat for Japan's economy? Who needs candy on Halloween when the stock market is giving out such big treats. Take a look at the headline numbers: The S&P 500 is now up 9% for the year. No, that's not the 30% gain we saw in 2013, but it's still very solid. Those who stayed in the market despite the turmoil earlier in the month are having an extra Happy Halloween. The Nasdaq is up nearly 11% for the year, and the Dow is almost 5% higher. This October rebound has been so sweet that the Dow and S&P 500 both closed at record highs (17,390 for the Dow and 2,018 for the S&P 500). The Nasdaq didn't set a record today, but it's at its highest point other than the March 2000 Dot-Com peak. Like the house that gives out the giant candy bars to trick-or-treaters, the Bank of Japan gave the market an extra large boost Friday by announcing additional stimulus measures. The move was unexpected, and markets around the world are surging on the news. The Dow jumped 195 points Friday, putting an exclamation point on the month. This year's rally might not be done yet. 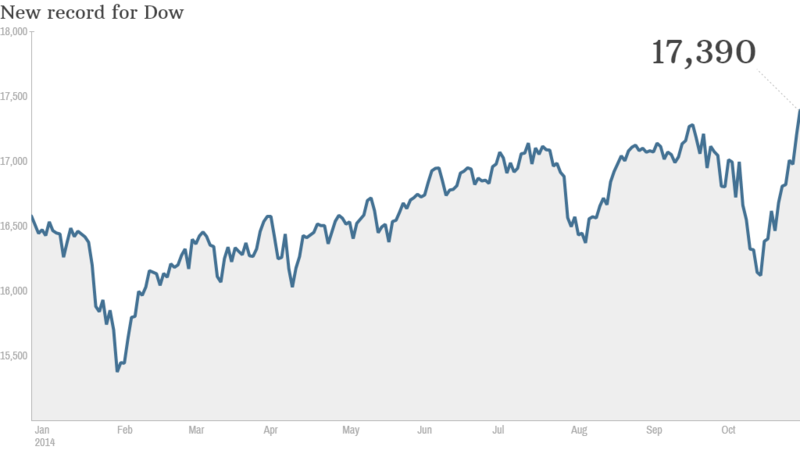 According to CNNMoney's survey of investment strategists, stocks could end the year around this level or a little higher. So what drove the big turnaround? It's pretty straightforward: earnings, earnings, earnings. Investors like when companies beat on earnings, sales and profits, and by and large, that's what the market is getting. Over 75% of companies in the S&P 500 that have reported earnings so far have beaten analysts' estimates, according to S&P Capital IQ. Businesses also give a sense of what they expect in the months ahead. Again, with a couple of notable exceptions such as IBM (IBM) and Amazon (AMZN), the outlook isn't looking too bad. All 10 sectors of the S&P 500 are predicted to show earnings growth this quarter. Even some of the riskier "momentum" stocks are delivering. Trader favorite GoPro (GPRO) jumped 13% Friday after the company reported strong growth. and Expedia (EXPE) rose more than 5% after reporting a bump in bookings. The overall picture is solid, and that is making investors a lot less nervous. 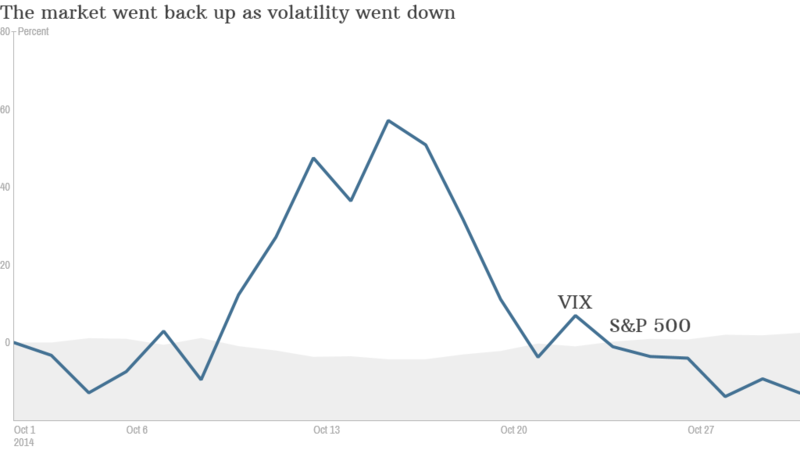 The VIX volatility index -- the market's fear gauge -- is a good reminder of just how much the market panic has subsided. As fears about everything from Ebola to a stalling Europe to a possible early rise interest rates spooked investors, the VIX spiked. It peaked mid-month -- briefly hitting the 30 mark on its worst day -- and is now back under 15, a very low mark. What's next? Going forward, there are still headwinds, but the consensus is that the U.S. economy is growing and companies and stocks will continue to benefit. A Goldman Sachs research note Thursday predicts 3% GDP growth the next few years. While Europe and other parts of the world remain troubled, Goldman reminds that foreign sales account for about a third of revenue for S&P 500 companies. That means the vast majority of the revenue is still coming from America. As long as the U.S. economy stays on track, modest optimism will continue.